Very good rains in Delhi NCR last 24 hrs ended Saturday Morning..averaging 55 mms amongst all the Observations ( Vagaries' Estimate 30 mms)...Highest being 93.8 mms at S'Jung, 92 mms at Lodhi Road, 89 mms at Mungeshpur, 70.4 mms at Palam and 63 mms at Gurgaon. Only 5 mms were seen at Akshardham and 24 mms at Jhajjar. (On going thru the previous posts, we will see that it was mentioned in the Forecast and El Nino estimates, that the Northern regions of the Sub Continent can get good rains as the Western Disturbances will have a "free hand" to inter act with axis, which is North of Normal, in absence of any resistance). 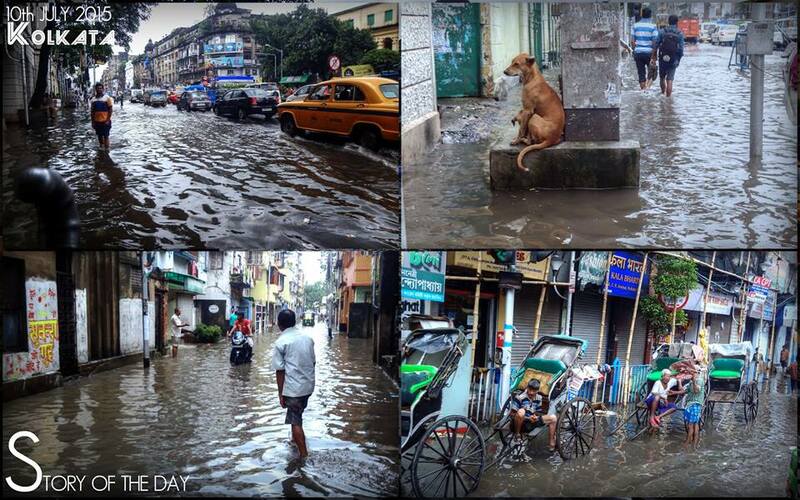 Sent by Vagarian Santosh from Kolkata"
This was The Story Of the Day ! Rains and Kolkata - "An Infinite Saga"
Due to good influx of moisture and embedded in a upper air trough, BB-2 in a fast development has strengthened to Depression strength. Mumbai gets a few passing showers this weekend. The wait for meaningful rains continue. Delhi NCR got the weather we expected, a cool and rainy day. Eastern Parts (Hindon) received as much as 62 mms in the day, along with another 43 mms in Noida. Saturday and Sunday will be cloudy, with rains increasing Sunday evening..
Hyderabad (India) remains mainly dry with very light drizzles in some parts or in vicinity. 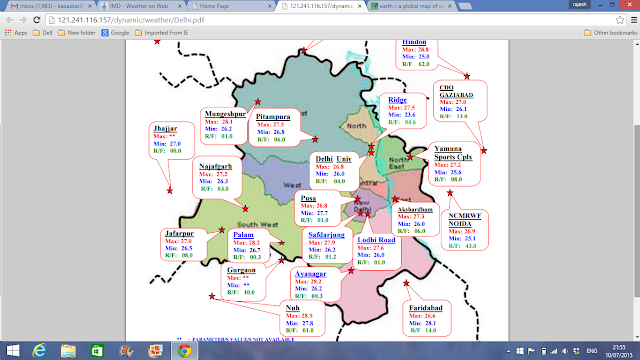 Bangalore light rains (less than 3-5 mms) as shown. But increasing rains from Monday, and the Garden City may cool down a bit. Indore gets increasing showers on Sunday, maybe upto 10 mms on Sunday. Nagpur: good rains in the day on Saturday, around 15 mms, but decreasing from Sunday. Surat and Valsad: After high hopes, may get Light precipitation on Saturday and Sunday, being cloudy weather. Around 3-7 mms per day. Frequent showers of around 30 mms/day for Goa this weekend. The West coast trough boasts a bit this weekend...Heavy rains in coastal Karnataka this Saturday and specially Sunday. Some rare weather reading for Faridabad Aws.Max temp 26.6℃ and min temp℃28.1℃.Although it is possible but not sure whether it is error or real one . weather in pune for coming week ? All surprises Rajesh Sir saying Bangalore "Garden City"? -> Actually it is barren, garbage city. Trees are so few that it can be counted on fingers - BBMP,BDA,BMRCL only cut trees with no plantation. Compare this with Navi Mumba/Thane/Mumba0 - NMMC,BMC,Maha forest dept,CIDCO have created forests within cities! @sset : I thing your statement is exaggerated.. I agree that many trees are uprooted..but still many areas are too green to be compared. Still Bangalore never touches 34C except in March,April.. Bangalore have old trees..So I think saying "Garden City" is fine.. It still holds TRUE. But it is on alarming conditions..
@SSET: Bangalore is called the garden city of the country for it’s large parks and open spaces in addition to tree lined avenues in almost all parts of the city. Lalbagh the 120 acre garden and Cubbon park an 80 acre garden are two major green areas of the city. The other lungs of the city are the palace grounds and the golf course within it’s limits.So it was called garden city and Pensioners Paradise. Can you please put forecast for Pune and ghat section for next week? When can we expect monsoon axis to shift lower to benefit interior maharashtra and ghat section. If I am not wrong if axis shifts downwards then only interior maharashtra and ghat section will benefit. Anyway Naveen Ankampalli u are projecting BANG of 70s (30 years back) - just visit Navi Mumbai u will notice diffeence - myself and tree lover groups of BANG are having constant fights/debates with BANG BBMP/BDA/BMRCL for horrible anti-environment policies - anyway MAHA is 100% better from environment aspects compared to KAR- let us not debate this on weather blog - deep respects to BANG. 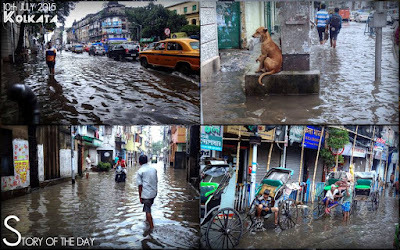 Anand: I had mentioned reducing rains in Kolkata after Friday (for the weekend). Annop Rawat: It happens if at 8.30 am the minimum recorded was 28.1c (as in this case), and 28.1c could be anytime before 8.30 am, say 6.30 am. Then after that time, the temp remains no higher than 26.6c as in this case...so the temp recorded at 8.30 am remains 28.1c as minimum. Karan and Atul: Yes, Monsoon axis should come Southwards, which is not happening.Light drizzle in some parts next 2/3 days in Pune. Days around 29c. 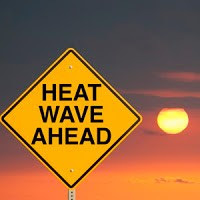 Rising to 31c Monday. sset: Navi Mumbai saw 8 mms rain Saturday. Putting up some lovely pics of green B'lore sent by Naveen.